(Nanowerk News) Researchers at the Wyss Institute for Biologically Inspired Engineering at Harvard University have mimicked pulmonary edema in a microchip lined by living human cells, as reported today in the journal Science Translation Medicine ("A Human Disease Model of Drug Toxicity–Induced Pulmonary Edema in a Lung-on-a-Chip Microdevice"). They used this “lung-on-a-chip” to study drug toxicity and identify potential new therapies to prevent this life-threatening condition. The lung-on-a-chip device, which the team first described just two years ago, is a crystal-clear, flexible polymer about the size of a memory stick that contains hollow channels fabricated using computer microchip manufacturing techniques. 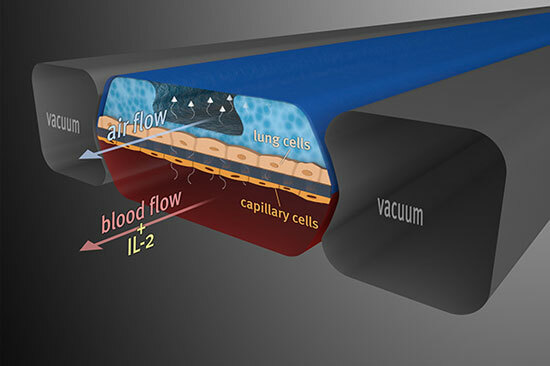 Two of the channels are separated by a thin, flexible, porous membrane that on one side is lined with human lung cells from the air sac and exposed to air; human capillary blood cells are placed on the other side with medium flowing over their surface. A vacuum applied to side channels deforms this tissue-tissue interface to re-create the way human lung tissues physically expand and retract when breathing. The Wyss Institute’s living, breathing lung-on-a-chip, made using human lung and blood vessel cells, acts much like a lung in a human body. A vacuum re-creates the way the lungs physically expand and contract during breathing. Wyss Technology Development Fellow Dongeun Huh, who also holds appointments at Harvard Medical School (HMS) and Boston Children’s Hospital, studied a cancer chemotherapy drug called interleukin-2 — or IL-2, for short — in the lung-on-a-chip. A major toxic side effect of IL-2 is pulmonary edema, which is a deadly condition in which the lungs fill with fluid and blood clots. It turns out the physical act of breathing greatly enhances the effects of IL-2 in pulmonary edema — “something that clinicians and scientists never suspected before,” says Ingber, the Judah Folkman Professor of Vascular Biology at HMS. When the team turned on the vacuum attached to the chip to simulate breathing, it increased fluid leakage more than threefold when treated with the clinically relevant IL-2 dose, and the Wyss team confirmed that the same response occurs in an animal model of pulmonary edema. This result could suggest that doctors treating patients on a respirator with IL-2 should reduce the tidal volume of air being pushed into the lungs, for example, in order to minimize the negative side effects of this drug. The cross-disciplinary, multi-institutional team that was led by Ingber and Huh also included Wyss postdoctoral fellow Daniel Leslie; Benjamin Matthews, assistant professor of pediatrics in the Vascular Biology Program at Boston Children’s Hospital and Harvard Medical School; Wyss Institute researcher Jacob Fraser; Samuel Jurek, a researcher at Boston Children’s Hospital and Harvard Medical School; senior Wyss staff scientist Geraldine Hamilton; and senior scientific investigator Kevin Thorneloe and investigator M. Allen McAlexander from GlaxoSmithKline. Ingber is also a professor of bioengineering at the Harvard School of Engineering and Applied Sciences.